But, as it turns out, the answer might actually be much closer to home - inside your kitchen in fact. 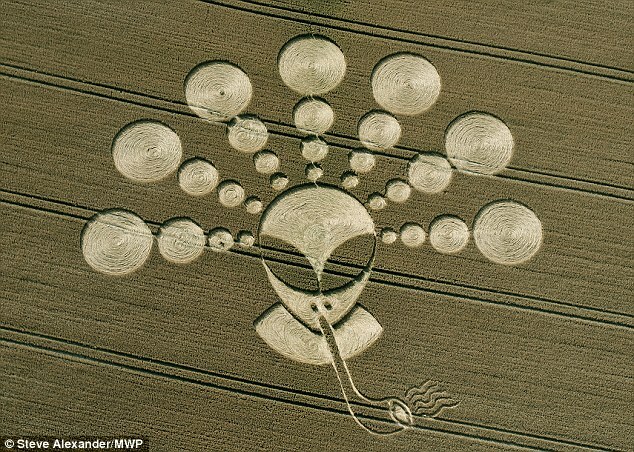 Because, for example, this 200ft image of a pipe-smoking alien – carved into a Wiltshire field – could have been created using an ordinary microwave oven, according to scientists. A handheld device called magnetron – made using parts from the common household cooker and a 12-volt battery – may have ushered in a new generation of crop circles. Professor Richard Taylor, a physicist, claims to be able to reproduce the intricate damage inflicted on crops using such a gadget developed by his team at the University of Oregon. He believes similar advances have been made by others – despite avid UFO spotters insisting that the growing phenomenon is beyond scientific understanding. Prof Taylor said microwaves – the radiation waves that are capable of heating food when utilised in an oven - cause crop stalks to fall over and cool in a horizontal position. 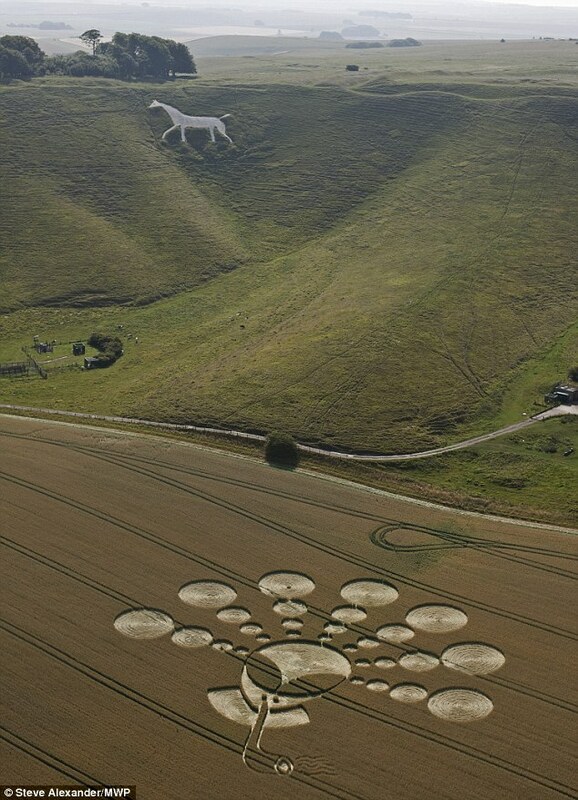 The technique could explain the speed and efficiency of the artists and the incredible detail that some new crop circles exhibit, such as the alien, which was created two weeks ago alongside an ancient white horse at Cherhill, near Stonehenge. Dispensing with rope, wooden planks and bar stools that have traditionally been used to create such designs, Prof Taylor suggested these spectacular patterns could also be carved with lasers. And he believes the satellite Global Positioning System could track the markings. Mathematical analysis of some of these ever-more complex designs has revealed the use of constructions lines, invisible to the eye, that are used to design the patterns. Writing in Physics World, he said: ‘Crop-circle artists are not going to give up their secrets easily. But as fascinating as the patterns are to scientists, farmers find crop circles infuriating. 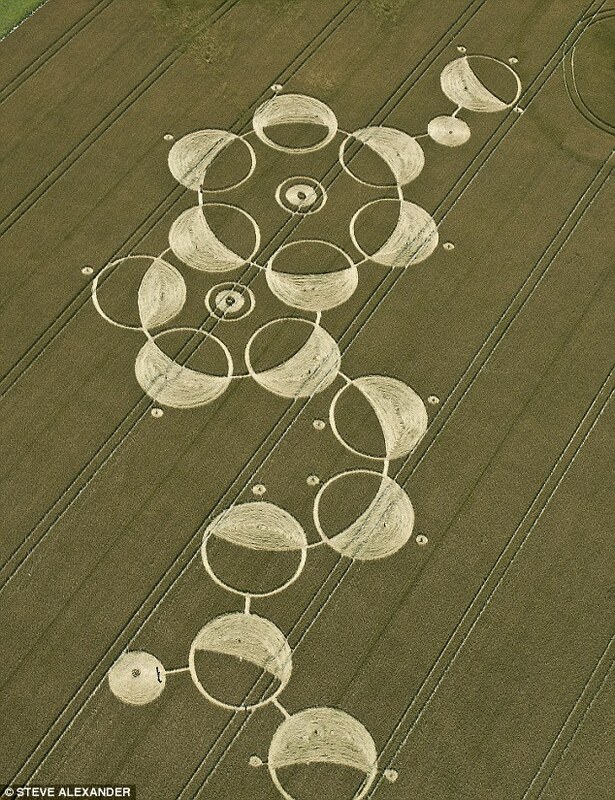 Tim Carson, who owns the land where the recent alien design appeared, has had 125 circles on his land since 1990. The price in ruined crops is particularly steep this year because of soaring fuel and fertiliser costs, and a 25 per cent drop in wheat yields due to the drought. ‘I’m beginning to get a bit tired of it all,’ said Mr Carson. Every year, 50 to 60 circles materialise in the rolling chalk downlands of Wiltshire. In the rest of the world put together, only 40 to 50 appear annually. And, in recent years, a booming tourist trade has developed. 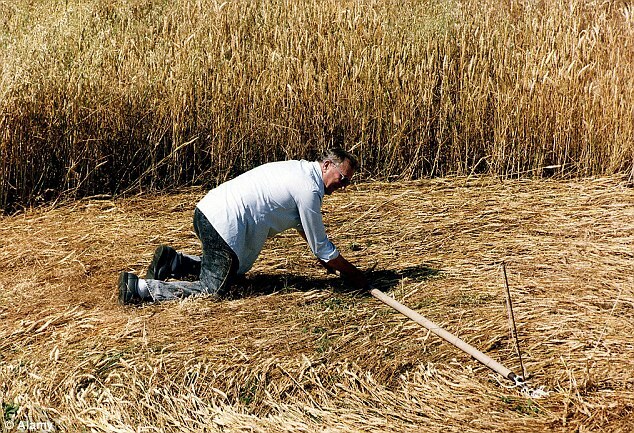 From Belgium, Holland, America, Norway and Australia, crop-circle enthusiasts come in their thousands — each with their own theory, each rushing to a new site as soon as it is reported. This week, within hours of the first reports of a new circle on Windmill Hill — near the neolithic stone circle at Avebury — a Dutch tour party of nine people rushed to the spot. ‘There are heaps of biophysical anomalies here,’ said the tour leader, Janet Ossebaard, 45, author of Crop Circles: Scientific Evidence. ‘This wasn’t made by people, otherwise you’d see damage from board marks [where hoaxers lay planks to flatten the wheat]. It’s been hit by a plasma vortex. ‘You can see the burn marks on the crops and cavities,’ she says, holding up a grain stalk, which does indeed have small holes in it. Crop circles have been reported in England since 1678, when a Hertfordshire news pamphlet referred to The Mowing Devil, a creature that cut a farmer’s oat crop into a series of concentric circles. In the 19th century, occasional circles were recorded and the first-known photograph of one appeared in Sussex in 1932. 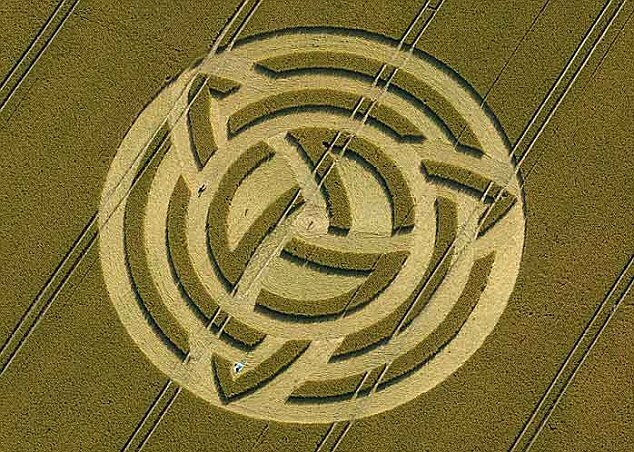 But it wasn’t until the early Nineties that Wiltshire crop circles started multiplying at an extreme rate. 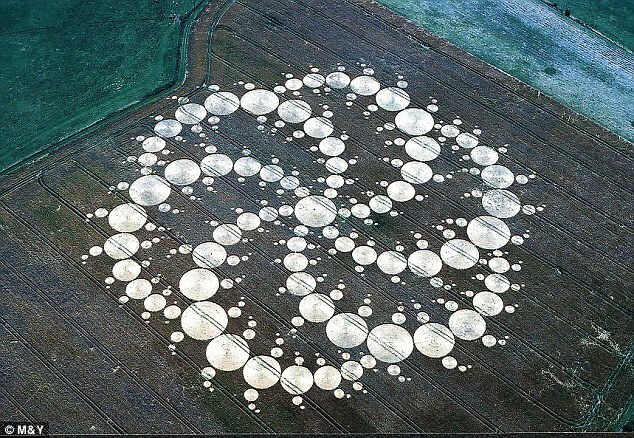 In 1990, Led Zeppelin released an album, Remasters, with a picture on the cover of an elaborate crop circle created on Mr Carson’s land.